Jump on your horse and get out of the temple, just like you always do. This time your way is similar to the way to the 4th colossus. You have to move to the east, but this time your way isn't the small dark and foggy path but to the left past the mountains there. Ride on the narrow but green path with the mountains to your right until you reach a bigger plain. At the end of the plain your fate leads you into the south eastern edge and along the small path that is there until you find some buildings that are in the water. Here you have to leave Agro und jump into the water. Swim under the small building that's in the middle of the water dive through the small arch on the waterlevel until you reach the square pillar. After climbing up the square pillar walk to the end of the platform and jump through the hole in the fence and drop down into the water. 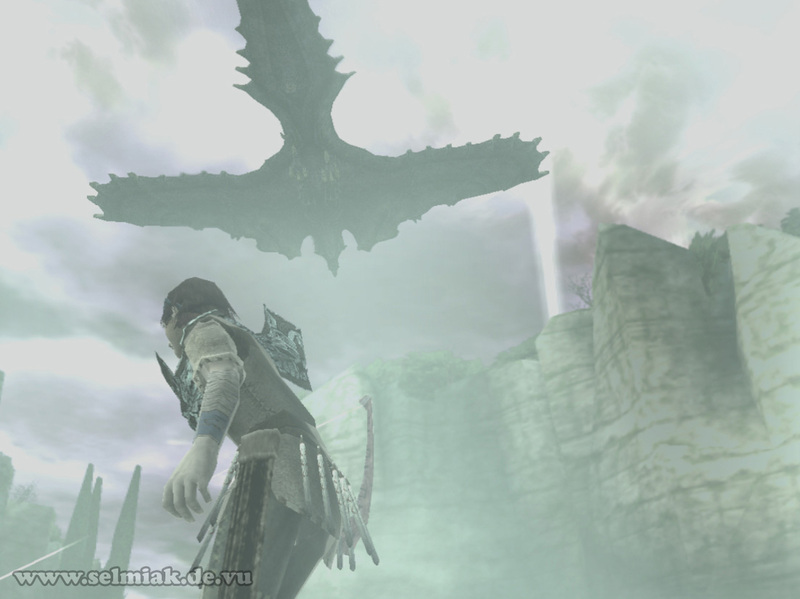 You now entered the area of the 5th colossus. 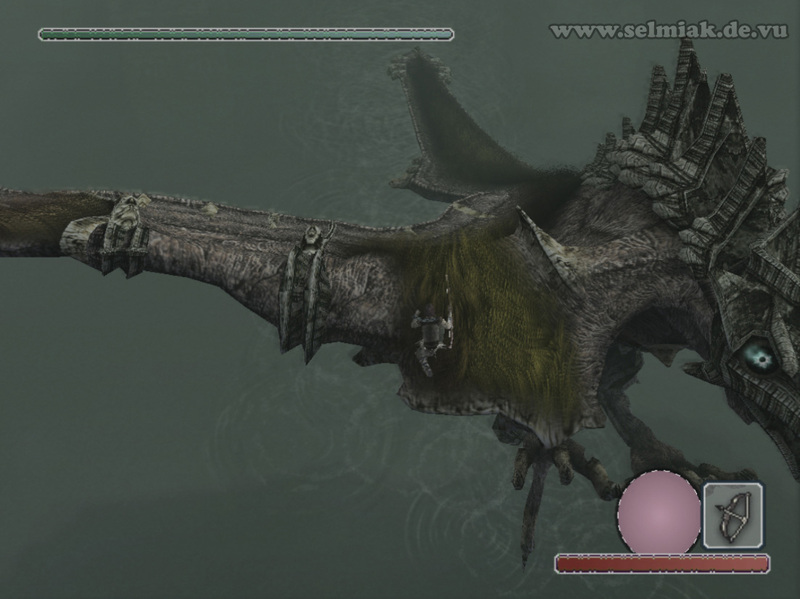 Right in the middle of the huge lake the 5th colossus is waiting for you on his pillar. His long and scabby tail is tangling over the surface. But you can't reach his tail as he seems to notice that you are up to something and moves away when come close. So you have to think of a different strategy. 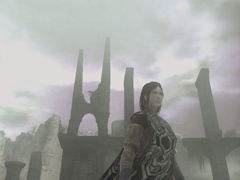 All around the central pillar are other decayed old buildings. 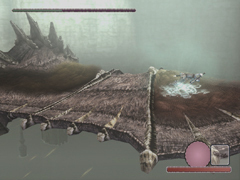 They look similar to bridges and under the bridge are some small platforms. There are two to three platforms under each bridge building. Swim to one of these platforms and stand on it. Now take a look around. If there are 3 platforms it's best to stand on the middle platform, if there are only 2 it doesn't matter which platform you stand on. Now you have to attract the attention of the birdy fifth colossus. Just shoot an arrow onto his old body. 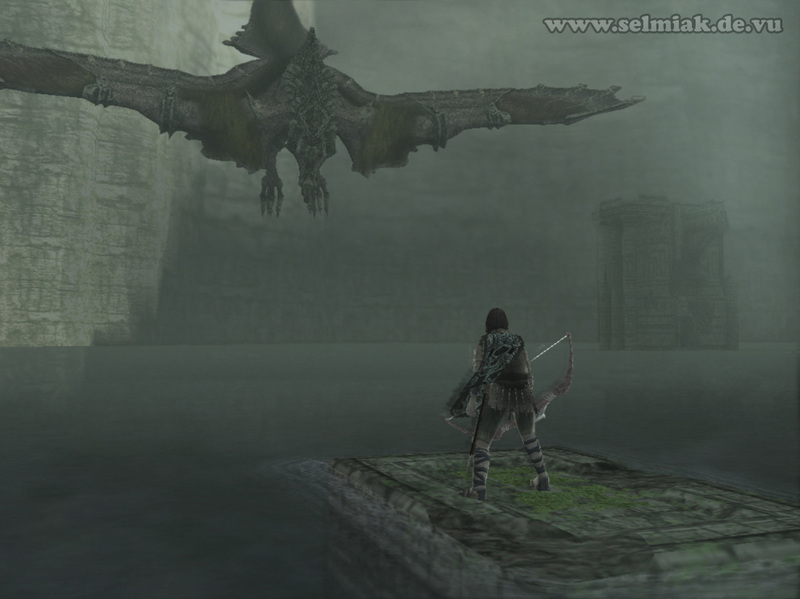 The colossus is not amused and will start flying around because he wants to know what is going on in his pond. While he is flying above you shoot him with another arrow in his crusty torso. 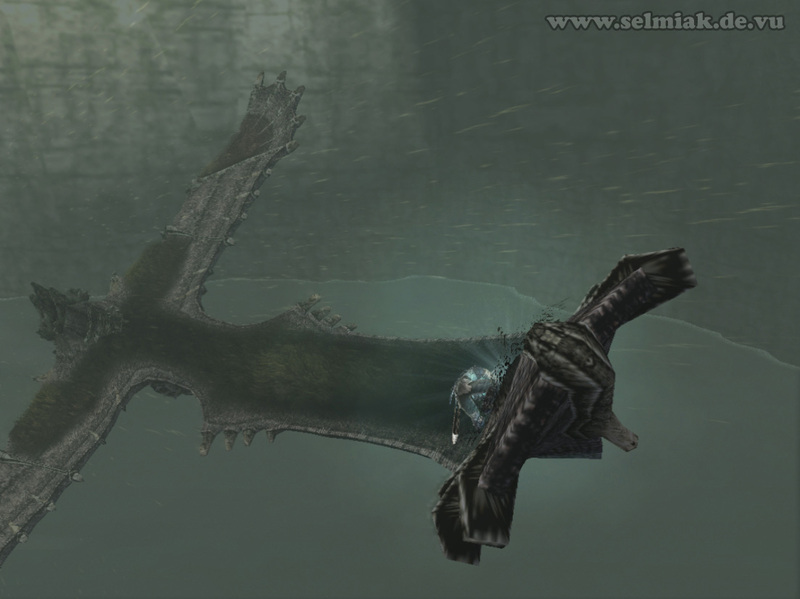 It's not that easy to hit him with an arrow because he moves quite fast, but you will notice when you hit him as he screams quite loud from the pain once you do hit the 5th colossus. Now you have to be careful. Watch him carefully and see where he is flying, after some circling above your head he will steer so that he is coming straight at you. Now you need good timing or you will lose a lot of energy while you are pushed away from the platform. Once the bird dives down you have to jump up and then grab hold to him. Now we fly through the air with unbelievable speed. Wait until you can control Wander again and climb up on the beast. Now move really slow and keep the slip stream up here in mind. 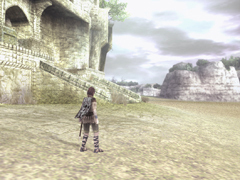 Move to the end of the long tail of the 5th colossus. Here you can find the first glowing ornament and you should work on it until there is only 1/2 to 1/3 of the health of the prehistoric bird left. Now it's getting really interesting. While at maximum speed you have to get back to the head of the monster. Walk careful, every time he is flying a curve you have to grab hold on. The last two glowing ornaments are at the tip of his wings, and this is exactly where we are going now! While he is gliding in flight and not flapping his wings you can run to the tip of the wings really fast and grab on there. Stick your sword into the ornament with full power and then hold on tight again as he will fly very chaotic now. This could cause you to fall down. In case your grabbing powers are running out you can run behind his head and recover there. If you grab hold there you can still recover as you are not hanging around (at least most of the time, in case you are in a curve with the bird this is something different). After recovery you can run to the end of his wings, hold on tight and smash your sword into his wounds. Do this with both of his wings until you defeated the 5th colossus. In case you are falling down or Avion shakes you off you have to swim to one of these platforms again, shoot him with an arrow and hop on him again. This can happen sometimes and is really annoying, but there is nothing else you can do (besides not falling down in the first place). You can play around with Avion a bit. 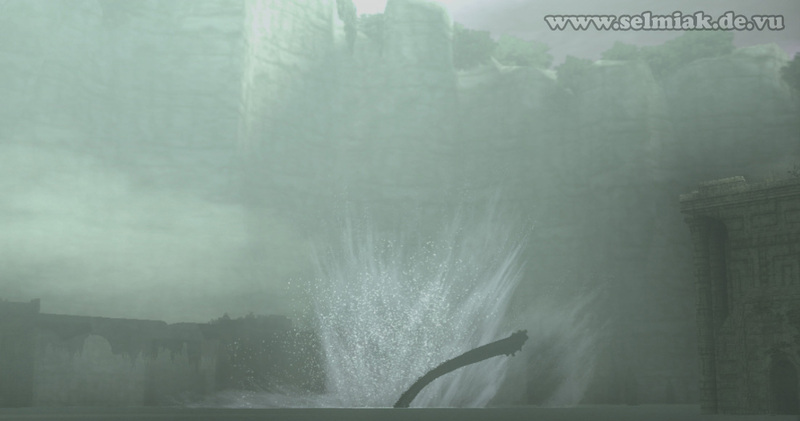 You can shoot him with an arrow while you are still on the entrance before jumping into the water. The arrow passes through the fence. In case you hit the fence just move a bit around and try again. Avion comes at you, looks at you strange and flaps his wings to blow you off from the tower. While you are on his back you can jump off and land on the buildings in the water. It's quite hard ti do this but the Cloth of Desparation is really helpful for this. Once you are there you cannot do that much at all besides being proud you archieved this. After some time Avion comes at you and flaps his wings to blow you off from the buildings too.